Banitsa (banica and banitza) is a traditional Bulgarian pastry. Traditionally, some lucky charms are put into the pastry on some of the national holidays or other occasions including; Christmas Eve, the first day of Christmas, New Year's Eve, etc. Beat the eggs in a bowl and combine the crumbled cheese, yogurt/milk and eggs together. Cheese should be lumpy so don't over mix. Melt the butter in a cup. Butter the bottom of a Pyrex or oven tray. Lay one sheet of filo dough and spread some melted butter with a brush all over. Then continue layering and spreading butter until 5-6 sheets one after another. Spread some of the cheese mixture on top, and distribute evenly. Then repeat layering and spreading butter in between for another 3-4 sheets. Pour some cheese mixture and repeat layering until all mixture is used. Lay the last 3-4 sheets on the top with no butter in between. Spread the rest of the butter on top. Cut in portion sized pie slices or squares and bake in the preheated 400 F (200 C) oven until golden (for about 30 minutes). 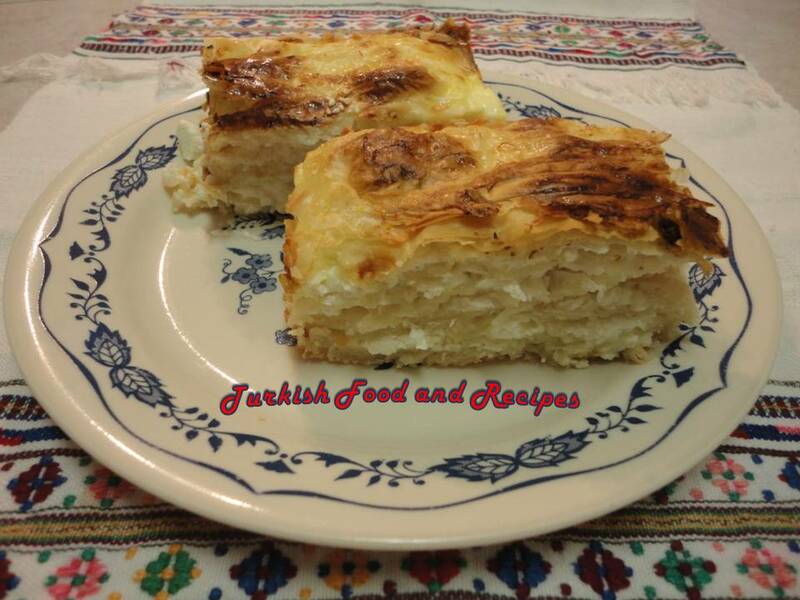 Banitsa is served for breakfast, brunch or any time with plain yogurt, ayran or boza. I would recommend Turkish tea with Banitsa. Served hot or cold, it is always tasty. Banitsa (banica and banitza) geleneksel bir Bulgaristan hamur isidir. Banitsa yapilirken geleneksel olarak icine bazi kismetler koyulur ve Noel ve Yeni yil gibi ozel gunlerde ya da bayramlarda servis edilir. Yumurtalari bir kasede cirpin ve uzerine yogurt/sut ve ufalanmis peyniri ilave edin. Peynir parcalarini cok dagitmadan nazikce karistirin.Tereyagini eritin ve bir kaseye alin. Borcam ya da firin tepsisinin dibini yaglayin. Bir parca yufkayi tepsiye yayin ve uzerini erimis tereyagi ile fircalayin. Sonra, ust uste 5-6 yufka olana dek yaglama islemine devam edin. Peynirli karisimin bir miktarini uzerine esit olarak dagitin. Tekrar tek tek yufkalari 3-4 tane olana dek tereyag ile yaglamaya devam edin. Yine peynirli karisimdan biraz koyun ve dagitin. Butun peynirli karisim bitene dek ayni islemi tekrarlayin. Son 3-4 parca yufkayi aralarina tereyegi surmeden en uste yerlestirin ve kalan tereyagini uzerine guzelce surun. Arzuya gore kare veya ucgen dilimler kesin ve onceden isitilmis 200 C (400 F) firinda yaklasik 30 dakika ya da uzeri kizarana dek pisirin. Banitsa kahvalti, cay saati ve gunun her ani sade yogurt, ayran veya boza ile ikram edilir. Benim tavsiyem yaninda Turk cayidir. Her turlu cok lezzetli oldugu icin sicak ya da soguk servis edilebilir. I'd love to try a new and exciting treat...This looks delicious! Thank you so much for posting this. I always wondered how to spell the name. This is just as my great grandmother made it around 100 years ago. Except she made her own filo on the kitchen table with a broom handle rolling pin. In the new country (Australia) we have corrupted it to use packet pastry and cheddar cheese instead of feta. A great family favourite.